Entrek Knives 8 1/2 overall. 4 3/4 440C stainless double edge dagger blade wit. 4 3/4 440C stainless double edge dagger blade with black Gun-Kote finish. Molded black Kydex belt sheath. 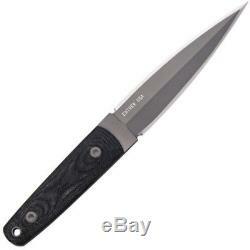 The item "Entrek Knives 8 1/2 overall. 4 3/4 440C stainless double edge dagger blade wit" is in sale since Tuesday, September 25, 2018. This item is in the category "Collectibles\Knives, Swords & Blades\Collectible Fixed Blade Knives\Modern Fixed Blade\Factory Manufactured". The seller is "rocky-mountain-tactical" and is located in Chilhowie, Virginia.